Query the Elasticsearch index. This is the most scalable and efficient way to perform a query. Benchmarks show querying the repository using this Elasticsearch index scales orders of magnitude better than the database. The natural way of expressing a query in the Nuxeo Platform is with NXQL, the Nuxeo Query Language. As you may see, there is no security clause, because the repository will always only return documents that the current user can see. Security filtering is built-in, so you don&apos;t have to post-filter results returned by a search, even if you use complex custom security policies. The Nuxeo Platform is also compatible with the CMISQL defined in the CMIS standard. Resources Endpoint are also based on a page provider. By being declarative, page providers are very easy to override. That way, most of the document lists logic of the default application can be redefined just by overriding the corresponding page provider. You can also build your own application in the same way. Note that in the web application, page providers are associated to a higher concept, the Content View, that wraps all the UI aspects of executing and presenting a search result (see paragraph below). The following table and schema gives an overview of the different ways of querying the repository. Search Endpoint (Client side) A resource oriented REST API that allows to execute direct NXQL queries or to use a named page provider that has been declared server side. 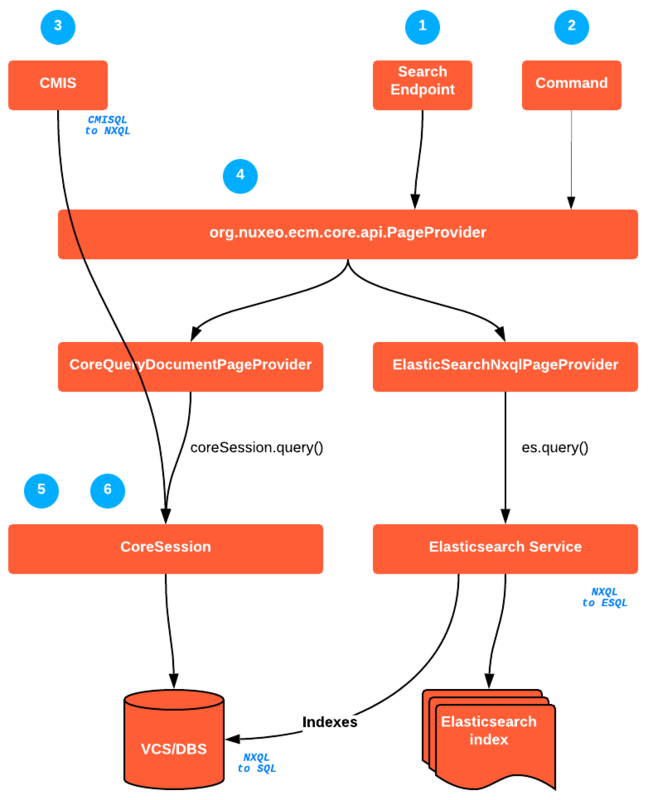 The API returns serialised JSON documents and offers all the mechanisms provided by Nuxeo Platform Rest API (Content Enricher, Specific headers…). Command Operations (Client side) A set of Automation operations allow to query a page provider that has been declared on the server. Scope is pretty much the same as with the search endpoint. CMIS (Client side & Server side) The Nuxeo Platform is compatible with the CMIS standard. CMIS covers query scope, using CMISQL. It is possible to query the Nuxeo Platform repository using CMISQL in Java server side, or via JSON-based or AtomPub bindings remotely. PageProvider (Server side) Page Providers objects implement the PageProvider interface. It provides in Java all the primitives for getting each documents, pages and related information. CoreSession.query (Server side) The CoreSession object is the main server side Java interface for accession among the repository. Among available methods is the query() that allows to perform directly an NXQL query and get a list of documentModels (the basic Java wrapping of a Nuxeo Document). In most of the situations it is better to rely on a page provider as it is easier to override, maintain, etc… but session.query() is still an option. CoreSession.queryAndFetch() (Server side) Like session.query(), CoreSession.queryAndFetch() provides a way to perform an NXQL query and get an iterable of Java Map instead of DocumentModel. CoreSession.queryProjection() (Server side) Methods queryProjection() allow to perform an NXQL query in order to get a page of projections as Java Map. Note: query() allows to get a page too, but you get a DocumentModelList as result. The default configuration uses an embedded Elasticsearch instance that runs in the same JVM as the Nuxeo Platform&apos;s one. By default the Elasticsearch indexes will be located in nxserver/data/elasticsearch. This embedded mode is only for testing purpose and should not be used in production. See the documentation to setup and configure an Elasticsearch cluster. Both VCS/DBS implementations and Elasticsearch provide full-text search capabilities. Depending on the back end (Oracle, Postgres, SQL server, …) capabilities may be slightly different. The Elasticsearch implementation performs bests in terms of relevancy, for configuring dictionaries, running the stemming etc. Thus it is advised to leverage an Elasticsearch page provider when you want to do searches on full text index. More documentation can be found about full-text search expressions. You should also read carefully how you can tune the full-text index for maximizing the relevance depending on your context of use. Aggregates are a way to compute additional information on a search result so as to group and count result items and project them against various axis. For instance, "in the search result, 5 of the documents have the value "Specifications" for the field dc:nature ". The Elasticsearch page provider implementation provides aggregates support. It is possible to define which aggregates can be requested to Elasticsearch with each queries, and a mechanism is implemented so as to filter following queries with the aggregates system offered by Elasticsearch. It is possible to leverage aggregates both at the API level and in the user interface, where a set of dedicated aggregates widgets has been added. They can be used from Nuxeo Studio. See the How-to about aggregates widgets. Searches have been conceptualized throughout the notion of “page providers” in the Nuxeo Platform. The Page Provider object holds all the necessary information for rendering a search: a NXQL query, pagination logics, quick filters, sorting capabilities etc. Page providers are used in a non-UI context: you need to generate the form layout and the corresponding result layouts to display the search to the users (in Nuxeo Web UI typically). These elements are fully configurable via Nuxeo Studio which makes it a matter of a few minutes to configure new business specific search screens for your application users. The section Elasticsearch Indexing Logic provides more details on how documents are indexed in Elasticsearch.